The area of Palaikastro town, in eastern Lasithi of Crete Island, presents a significant tourist activity, especially during the summer. It is located near important sites of alternative tourism (Gorge of the Dead, Vai beach and the homonymous palm forest) and other beautiful beaches (Kouremenos, Kato Zakro, Chiona etc.). The fishing harbour, on the northern edge of Kouremenos Gulf, is the town’s anchorage and the only organized port facility along the east coastline of Crete. Thus, the entire fishing fleet of the area seeks shelter inside its basin which results in great congestion, despite the fact that the existing infrastructure cannot serve successfully the demanded number of boats and offers inadequate protection from south and southeast waves. In view of the above difficulties, there was a proposal for a new design of expansion works. 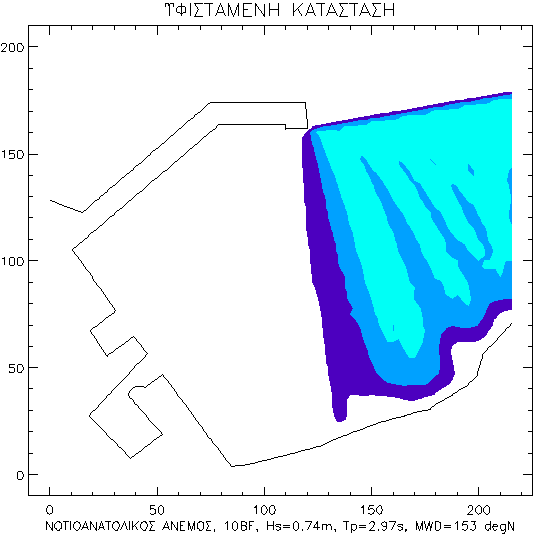 In order to review this design, the former Municipality of Itanos, in 2006, assigned CNWAY the preparation of a wave disturbance study, so as to determine and evaluate the wave conditions inside the basin, after the construction of the new works. The study was realized through the preparation and implementation of the respective numerical model simulations. 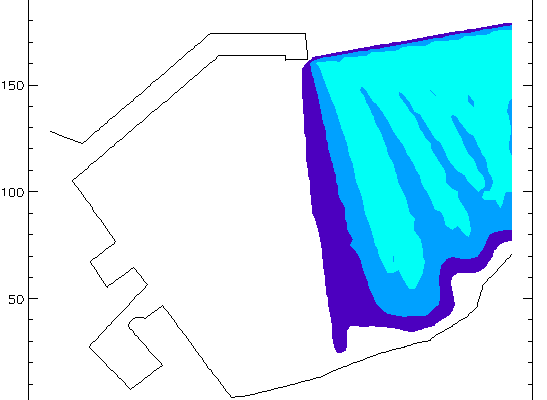 The results of the study showed that the proposed works offer an effective protection of the basin from south and southeast waves, in occasions when these winds blow with an intensity up to 10bf. A small disturbance, up to 0.5m, is observed in the entrance of the harbor and along the quay walls of the leeward mole. This disturbance is considered acceptable, in all respects, for fishing harbours.